Enrichment equipment is the technical term, but around here, we call it plain old fun. Our goats main pasture already had three wooden spools of various sizes for the goats to jump on or lounge under. But, if three are good, more must be better. And, it is! We now have seven spools of various sizes for the does and their kids to play on, under, and around. I confess I am uncertain who has the most enjoyment from the new toys; the goats who pounce around on them or me watching them from my studio window. In the coming days, between the demands of preparing garden beds, adding moulding to finish the new kitchen window Sean installed, fencing in the kitchen herb garden, planting our orchard, clearing the mudroom, and cleaning out the chicken coop and barn stalls, we will spend some time making the new play equipment even better. Our plan is to increase the distance between the shorter spools and secure walkways between them. We'll turn the shortest spool on its side and create a teeter-totter from it. We hope these changes will make the play equipment even more fun for the kids and yearlings to explore. One upgrade we want to make this season is adding grooming station areas. Our thought is to recycle old, worn out wooden push broom heads. I can buy inexpensive brooms online for less than $10, but we try to breathe new life into things that would otherwise be discarded. So, while I will purchase some if necessary, I would much prefer to put out my plea and give y'all an opportunity to put your unused, worn out push broom heads to good use. 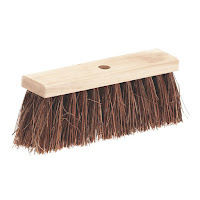 :) We need wooden heads with natural bristles, like the ones pictured here. It honestly doesn't matter how tattered they are, so long as the wood is sound to screw through. Our plan is to screw through the bristles and wooden head into the wood of the spools. Some affixed from overhead, some along the sides. These will give the goats places that will feel good to scratch itchy growing horns and shedding undercoats on. If we can collect enough, we'll add scratching stations inside the barn, too. 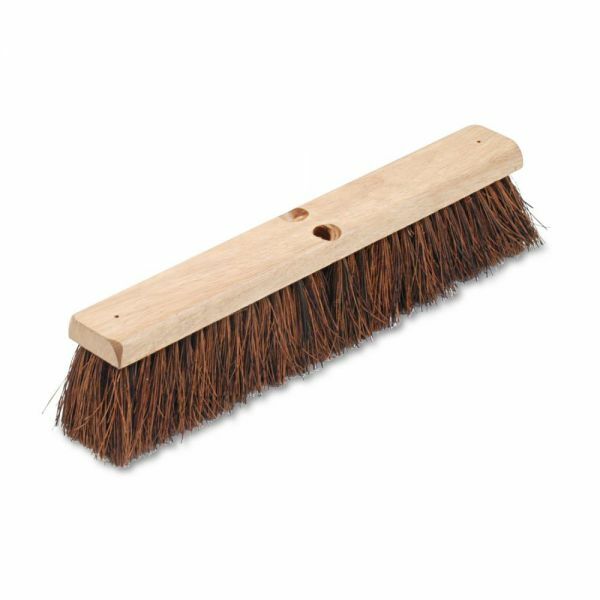 As a bonus, we'll offer a trade: we'll gift you with a bar of our fantastic goat's milk soap for each usable broom head you donate to our cause. If you would like to donate your used wooden push broom head to our goats, feel free to call or text Sean at 207-323-0520. Today is apple tree planting day. We may try out a live remote while we put them in the ground and spend some time in the field with the goats. If you have "liked" us on Facebook, you'll get a notification when/if we do. Thanks for visiting with us today, friends.